The rising concern for safety has led to the defense sector across the world focusing on wearable robotics with their soldiers. Exoskeleton systems are one of the major areas of interest in the wearable robotics for defense applications. These suits give soldiers an additional strength to lift up heavy loads and also move swiftly in the battlefield. Moreover, the changing concept of warfare has led to the development of biological weapons, which can be deadly to the human body. To prevent direct contact to the biological elements, armies across the globe are investing in military exoskeletons. Against this background, the global market is expected to register a CAGR of CAGR of 14.4% to rise from US$924.5 mn in 2016 to reach US$3,042.4 mn by the end of 2025. However, the market faces a tough challenge of procuring these suits due to high cost. The global military exoskeleton market has been segmented by types into full body exoskeletons and partial body exoskeleton. The partial body exoskeletons are expected to witness strong demand during the forecast period due to the rising application of these exoskeletons to provide support to injured soldiers. However, the ongoing research and development is expected to result into the development of flexible full body exoskeletons at lower prices which is expected to drive the demand in future. Analysts expect that the partial military exoskeleton segment is likely to be worth US$1,977.0 mn by the end of 2025. On the basis of power, the market is fragmented into active exoskeletons and partial exoskeletons. The active exoskeletons are integrated with hydraulics and actuators which provided added strength and endurance to the soldiers during combat. Hence, the active exoskeletons have been analyzed to dominate the global military exoskeleton market during the forecast period. Regionally, the global military exoskeleton market is divided into North America, Europe, Asia Pacific, the Middle East and Africa, and Latin America. North America and Europe have been anticipated to be the most dominating region with over 50% of the global market in terms of revenue. North America includes the U.S. and Canada which are investing heavily towards the development of lightweight exoskeletons for the soldiers. The volatile political situation and deployment of the U.S. soldiers in the certain areas of the Middle East is primarily driving the need for upgraded military wearable and exoskeletons in the region. These factors are in return creating the need for military exoskeleton systems in Europe as well. On the other hand, the emerging economies such as India and China are focusing on upgrading their defense capabilities which is in return expected to drive the demand for military exoskeletons in this region significantly. The rising defense budgets in these countries, growing concerns about border security, and increasing incidents of internal security violated have also had a positive impact on the Asia Pacific military exoskeleton market. Some of the important players operating in the global military exoskeleton market are Lockheed Martin Corporation, BAE Systems, Raytheon Company, General Dynamics Corporation, Boeing, Honeywell Aerospace, Ekso Bionics Holdings, Bionic Power, Safran S.A., and SpringActive, Inc.
Military exoskeleton is robotic-like suit which provides powered assist and increase the strength of the soldiers during combat. There are several factors driving the demand for these exoskeletons globally. The increasing concern for security and safety from growing criminal activities and cross border terrorism has resulted into the need for soldier safety during warfare. A military exoskeleton suite empowers the soldier to lift heavy weights, run at faster speeds and defend themselves from enemy attacks. Moreover, the changing concept of warfare has led to the development of biological weapons which are more harmful to the body. These can also prevent direct contact of the soldier from harmful gases. These factors are aiding to the demand for exoskeleton suits globally. Furthermore, the need for quick coordination during warfare has led to the need for advanced communication systems which cannot be tracked by the enemy. Hence, the soldier suits need to be integrated with these electronics which include range finders, optronics, radios and navigation systems to name a few. However, the integration of these electronics increases the overall weight of the suits and makes it difficult for the soldiers to move swiftly. The development of lightweight exoskeletons will reduce the weight considerable and give added advantages to the soldiers by enhancing their mobility. These factors are expected to drive the demand for military exoskeletons considerably during the forecast period. However, a primary reason restraining the growth of the market is the price involved in procuring the exoskeletons. One exoskeleton suit can cost up to USD 150,000. Furthermore, the defense agencies need to place order in large quantities which can further increase the cost of procurement. The global military exoskeleton market has been segmented by types, power and geography. By types, the market has been segregated into full body exoskeleton and partial body exoskeleton systems. The partial body exoskeletons are expected to dominate the military exoskeleton market globally. Furthermore, the market has been bifurcated by power into active exoskeletons and passive exoskeletons. Currently, the active exoskeleton systems are witnessing higher demand in the market due to need for providing the soldiers increased strength and stamina in the battlefield. By geography, the global market has been segmented into five important regions consisting of North America, Europe, Asia Pacific, Middle East & Africa (MEA) and Latin America. North America and Europe has been analyzed to lead the global military exoskeleton market during the forecast period. The global report of military exoskeleton systems also includes the key trends expected to affect the demand and supply of the exoskeletons in future. Moreover, the market attractiveness of the various types of exoskeletons have been included in order understand the future opportunities of these segments. 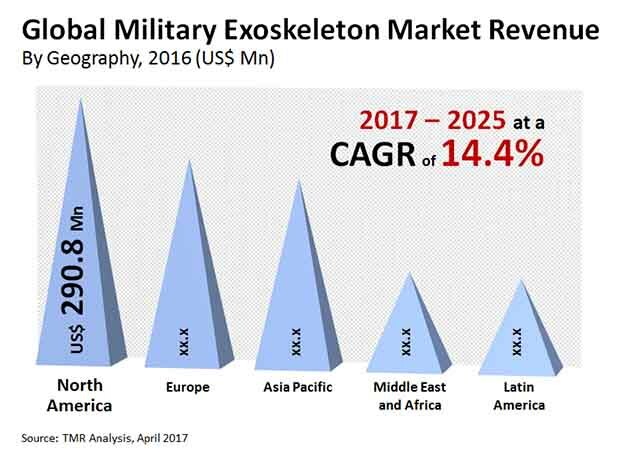 The global market of military exoskeletons has been tracked in terms of revenue from 2017 to 2025 where in 2016 has been considered as the base year of the study. The global market of military exoskeleton is witnessing intense competition from the leading players operating in the market. These players also undergo mergers and acquisition in order to sustain in the competitive environment. Furthermore, some of the players also follow a strategy of working in collaboration with others in order to create innovative products. The report also includes a detailed company profile of the major players which includes the company overview, product segments, and financial performance over the last three years, SWOT analysis and the business strategies adopted by them. The key players profiled in this report include Lockheed Martin Corporation (U.S.), BAE Systems (U.K.), Raytheon Company (U.S.), General Dynamics Corporation (U.S.), Boeing (U.S.), Honeywell Aerospace (U.S.), Ekso Bionics Holdings (U.S.), Bionic Power (Canada), Safran S.A. (France) and SpringActive, Inc. (U.S.).